November 29; The 7th Youth Parliament Pakistan Members will depart for a study visit to the UK and Denmark spanning from November 29-December 05, 2015. 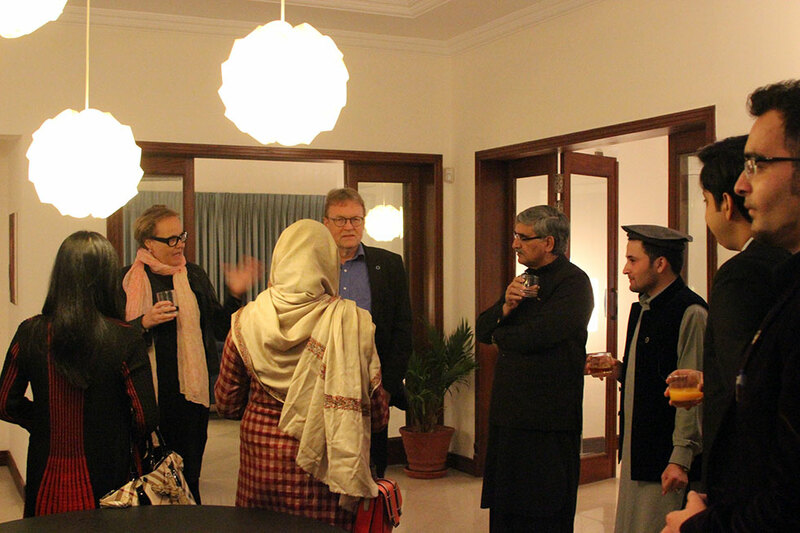 The visit is being facilitated by PILDAT (www.pildat.org). The 13-member delegation will spend 5 days (November 29-December 05) of learning and interaction in London & Copenhagen. The Study Visit is organised to facilitate learning about the democratic and Parliamentary systems, institutional measures of public accountability and transparency of Governments, interactions with members of Parliament and discussion on particular issues facing Pakistan and youth of Pakistan, etc. Members of 7th Youth Parliament Pakistan who will depart on November 29, 2015 include: Mr. Abubakar Ayesh (YP4-58-AJK01), Ms. Anusheh Bakht Aziz (YP3-16-PUNJAB05) Deputy Speaker Third Session, Mr. Ayaz Haider Bangash (YP3-55-FATA01), Mr. Daniyal Hassan (YP1-53-ICT01), Mr. Emaad Durrani (YP4-03-BALOCHISTAN03) Leader of the Opposition, Fourth Session, Mr. Qaiser Nawab (YP4-09-KP05), Deputy Speaker, Fourth Session, Mr. Saifullah Hassan Rana (YP4-51-SINDH11), Leader of the Opposition, Fourth Session, Syed Tauqeer Mehdi Kazmi (YP4-61-GB02), Ms. Uzma Gul (YP2-51-SINDH12) Deputy Speaker, Second Session and Mr. Waleed Bizenjo (YP3-04-BALOCHISTAN04), Leader of the House, Fourth Session. PILDAT officials who will be joining the Delegation include: Ms. Aasiya Riaz, Joint Director, Mr. Faheem Ahmed Khan, Projects Manager, PILDAT, Ms. Aimen Khan, Projects Manager, PILDAT respectively. Mr. Jawad Ajmal, Assistant Director, Europe III, EU Division, Ministry of Foreign Affairs, Islamabad presented an official stance of Pakistan-UK & Pakistan-Denmark relations to the delegation members. 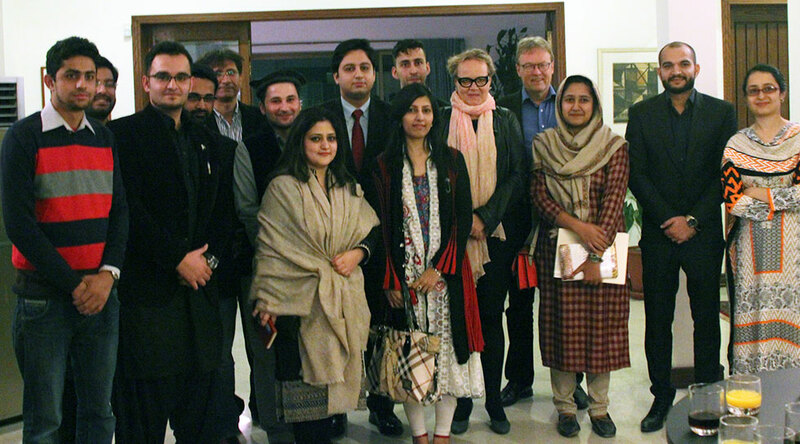 At a dinner reception held at the Danish Embassy today, Chargé d’Affaires, Ms. Helle Nielsen and Development Councellor Mr. Jan Riemer welcomed the delegation departing for London and Copenhagen. The members were briefed about Denmark political setup and the objectives of the Study Visit that the delegates could achieve during the visit. The Youth Parliament Pakistan, a PILDAT initiative, is aimed at inculcating in youth of Pakistan values and spirit for democracy, the importance of dialogue, tolerance for others’ views, an understanding of the concept of Parliament and its role in democratic decision-making and oversight.